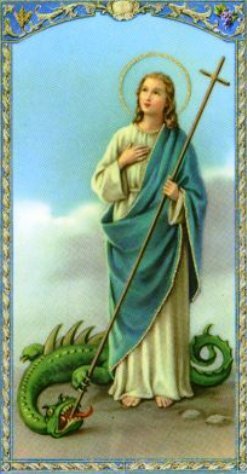 Probably my favorite thing that I learned about Martha is that, according to her saint's legend, she killed a dragon. Yep. She's not just a Martha Stewart type, she's also a badass dragon killer. Welcome to Part 3 of my series on Jesus and Gender! If you missed the introduction, check out Part I, and if you’d like to read about how radical even Jesus’ most passing interactions with women were for his day, check out Part 2. Part 3 will be devoted to the deep friendships Jesus had with women. I think this is important– so often when you hear this story (and if you are a woman and you’ve ever been in a women’s Bible study, you have surely heard this story presented this way), it’s all about how you don’t need to be a Martha, you need to be a Mary. But I don’t think that’s what Jesus was saying to Martha. I think he was affirming Mary’s choice and telling her sister, you know, your sister isn’t like you, and that’s OK. Soon we will see that even though she was often in the kitchen, Martha was still listening to Jesus teachings (ha, maybe like me she liked to listen to podcasts while she cooked?) and had great faith in him, just a different way of showing it. The next episode featuring Jesus and his friends Mary and Martha is John 11:1-43: Jesus raises Lazarus from the dead. The text says “Now Jesus loved Martha and her sister and Lazarus.” Also, “When Jesus saw [Mary] weeping, and the Jews who had come along with her also weeping, he was deeply moved in spirit and troubled.” Jesus had close, deep relationships with women, and when they hurt, he hurt. One of the most significant aspects of this text is Jesus’ interaction with Martha. Despite her being rebuked by Jesus for her criticism of her sister in the Luke story about these sisters, Martha demonstrates in this story that even though she was busy in the kitchen in that instance, she has not been ignoring Jesus’ teaching: “When Martha heard that Jesus was coming, she went out to meet him but Mary stayed at home.” This time it’s Mary who sticks to the world of the domestic and Martha who goes out to meet Jesus. I think this shows that Martha has learned from her encounter with Jesus, in which he said Mary was the one who chose rightly. Martha has learned and has now become the sister with the greater faith. However, in the next chapter, Martha’s sister Mary will demonstrate her faith not with a great confession, but with an act of great love. In John 12:1-8, Mary of Bethany, anoints Jesus’ feet while he dines at Lazarus’ house. Judas objects, but Jesus defends Mary. It should be noted that nowhere in this account does it say that Mary was a prostitute. Also: this is Mary of Bethany, NOT Mary of Magdala, aka Mary Magdalene. I’m on a mission to disabuse the world of the notion that Mary Magdalene was a prostitute, which is not stated anywhere in the Bible, but that’s a story for tomorrow’s post! Mary’s actions are as much a statement of faith as her sister Martha’s earlier words—she is anointing Jesus to prepare him for his burial, and in this is affirming her belief that he is the Messiah, and that he has been sent to die. To me, these two sisters, with their different ways of loving Jesus and showing their faith demonstrate that Jesus wants us to be who we are and serve and love him in ways that are natural to us, in ways that we are gifted. Tomorrow I’ll be tackling the topic of Jesus’ women disciples! A while back I picked up an old book at a flea market titled The Gospel of Mary Magdalene. I haven’t opened it yet. Know anything of it? You’re teaching me a lot. Gary– I know there is a non-canon Gospel of Mary, but I don’t know much about it. The Gospel of Mary is a very Greek work. It’s also not, to any real extent, about Mary. Mary, instead, provides a name to slap on what is a fairly obvious late document in order to give it credibility. By using Mary’s name the gospel author can “explain” why their strange Hellenistic gospel is the correct one despite the fact that others have already come through teaching a more orthodox gospel. Of course, this tactic works better when there aren’t similar tactics being tried using just about every other name in the New Testament including (a more recent discovery) Judas!